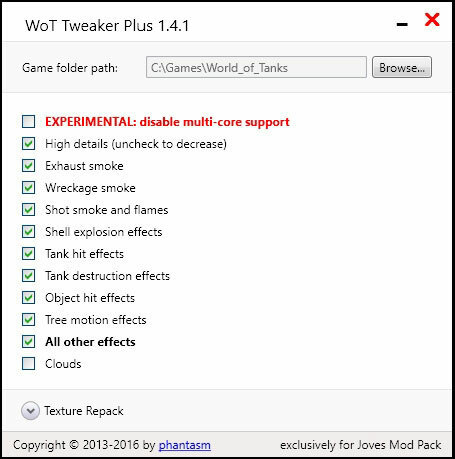 Members World of Tanks, which have at their disposal a low-power computers and laptops, with displeasure notice that the graphics are not installing the game tweaks. There is an option to do so, or like that, but in a different way will not succeed. And what can be corrected, so that such an effect can be removed, and without this feature graphics and “life is not sweet?” There is a simple and effective solution. Using fashion WOT Tweaker Plus for 1.4.1.2 Tanks of World . It is designed as an executable (program) file, which runs as a regular program installation. And it is here that, during installation, you can do whatever your heart desires. On the contrary those or other settings content requires tick, or vice versa, remove it. And there are plenty to choose. It is possible to completely remove the detail of objects on the gaming scene. Irritating to display clouds and swaying trees ?! Remove and do not show! The smoke from the exhaust pipe, that do to him? Leave! Chinese “Firefly” so cool begins to smoke on a long rise, without this spectacle! But in view of entering a house or other projectile can be an object, and sacrifice. After all, you need something to choose to increase fps in your favorite tank simulator.